Dr. Dana grew up in Bucks County, PA before attending LaSalle University in Philadelphia and majoring in biology. She also received a master’s degree in Laboratory Animal Medicine from Drexel University and worked in the laboratory animal medicine field before completing her veterinary degree at the University of Pennsylvania. 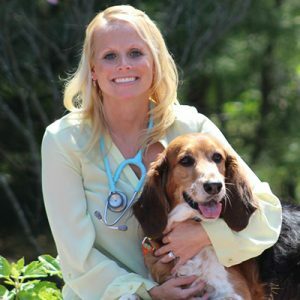 Dr. Dana joined HousePaws Mobile Veterinary Service in June 2013. Her professional interests include dentistry, pocket pets, preventative medicine, acupuncture, and internal medicine. She thoroughly enjoys participating in international service trips and local community events and has taken part in numerous programs educating pet owners on topics such as pet first aid and CPR, early disease prevention, animal dental health, and animal nutrition. In her spare time she enjoys teaching tennis to children, long distance running and volunteering with her therapy dog, Winston, at various schools, libraries and hospitals. Dana has fostered and rescued various cats and rabbits, including her English Lop Betty and her beloved three-legged cat, Penny.